These new biscuits from Nestle are the latest in the chocolate bars to have a biscuit edition. 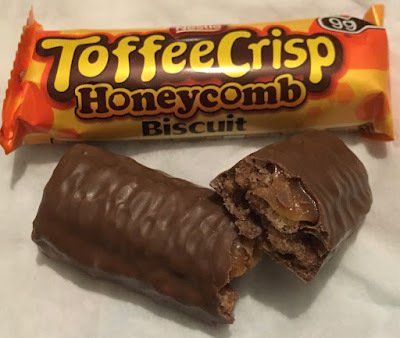 They are not based on the regular ToffeeCrisp bars, they are specific to the Honeycomb edition, and sounded perfect for someone like me with a sweet-tooth. I was also pleased to see that each individually wrapped biscuit is just 99 calories, making them a nice afternoon sugar fix, without too much guilt. The minute you open the wrapper there is a lovely aroma of rich toffee and chocolate that smells wonderful. I broke the bar in half to have a look, and could see all the different components. There is a layer of gooey caramel, underneath which are biscuits bits and honeycomb pieces. Like the aroma the flavour is a fab combination of chocolate, caramel and cinder toffee, and they are wonderfully sweet and indulgent. I loved the mix of textures, from the soft chocolate and caramel through the crunchy biscuits, and crispy piece of honeycomb. These new biscuits are perfect to pop into a lunchbox as a treat. The flavours are rich, but the size of the biscuits are small, and that seems to balance them out as well as keeping the calories down. They are a few bites of sugary indulgence, enjoyable without too much guilt.